I can vouch for the first two, having interviewed Leo Gallagher in 2000. Only Walter Payton was more difficult, repeatedly passing gas during our chat, lifting his leg for emphasis. Back to Gallagher. He had just sued his brother — who performed virtually the same act at smaller, more rural venues — because audiences were beginning to think “Gallagher Too” was the real thing. Leo Gallagher was hostile from the start, insulting my questions and insisting on knowing whether I was a fan. I did my best to change the subject but he wouldn’t relent. He then accused me of not “getting” his act, which he said was influenced by the copious amounts of weed he smoked. 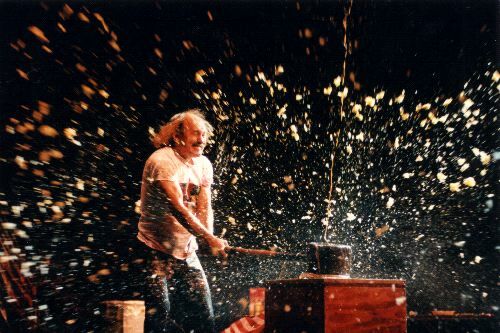 Meanwhile, his brother Ron (Gallagher Too) told me he was the first to smash melons with a mallet. Gallagher copied him, he said. (Gallagher insisted the melon smashing was his idea.) Their father vouched for the brother with no money, which tells you something about Leo Gallagher. The courts sided with Leo, who was granted an injunction prohibiting Gallagher Too from performing his act. Ron Gallagher, now unemployed, was forced to pay his brother damages. Leo apparently used that money to hire a new joke writer, David Duke. Good Lord! Does this guy like anybody? Although I am in partial agreement with the tattoo statement. I am an old fogey who would never have one, but people have the right to pierce and tattoo to their heart’s content. If it’s offensive, I look away. I think the Hebrews consider tattooing to be a sacrilegious act, and one cannot be buried on sacred ground if their body is tattooed. Hitler’s tattooing numbers on them prior to exterminating them was an atrocity in itself. Ron AND Leo Gallagher are the roles a slimmed down Jack Black was born to play in a made for TV movie! I really feel for Ron but he took it too far by blurring the line which his older brother set as a condition of the act. A contract agreement was entered into by the both of then and Ron broke that contract. Whether or not either is a religious nut is another story. I cannot for one moment think he’s all that conservative when he deliberately lifts his leg to pass intergalactic gas during an interview, though, that might be a comedic act in and of itself…the pot thing, too, is a sign that he’s the complete opposite of conservative. Sounds to me that he just likes things his way and a few things just happen to side with conservatism. Anyway, good article. I would like to hear more on these two so-called comedians. Gallagher (won) was actually pretty funny when he wasn’t doing the “Sledgomatic” bit. Ok….done shitting. STAY HARD LEO!! !